A young reporter has scored top honours at this year’s Wales Media Awards after winning four prizes. 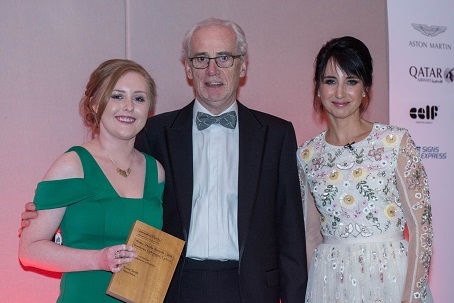 Katie Sands achieved the rare double of being named both Young Journalist of the Year and then overall Journalist of the Year at Friday’s ceremony in Cardiff. The WalesOnline reporter also took home the Digital Journalist of the Year prize as well as the joint award for Story of the Year with Western Mail & WalesOnline colleagues Adam Walker & Steffan Rhys for their work on the 50th anniversary of the Aberfan disaster. WalesOnline writer Will Hayward won the Online Journalist of the Year award while Ben James was named SPorts Journalist of the Year. The website itself was named News Website of the Year with the Western Mail named Newspaper of the Year. WalesOnline’s editor-in-chief Paul Rowland said: “I’m thrilled to see the work of our outstanding team recognised in this way. Katie, Will and Ben are three absolutely outstanding young journalists whose awards are richly deserved, but the team awards for the Western Mail and WalesOnline are a credit to the entire team, who all bring awesome creativity and graft to work with them every day. There was an outstanding contribution award to Peter Jackson, the former Belfast Telegraph and South Wales Echo reporter who went on to achieve global recognition for his writing & broadcasting after joining the Daily Mail in 1974. The Wales Media Awards are organised on behalf of the Journalists’ Charity, with support from a range of sponsors and partners including Comtek Sorrento Networks, Google, Camelot, Western Power, the NUJ and the Welsh government.